Fixed fire extinguishing installation. The stop valve on the hypermist fixed firefighting system was found in the closed position rendering the system unavailable for immediate use in the event of a fire. The engineering crew also did not know when the system was last tested nor could they produce any records documenting the last test. Detection. The engineering crew could not produce records or procedures for testing the heat detectors in the engine room. Auxiliary Engines. The PSCO observed the manual cranking inertia starter inoperable. Fire drills. Crew is not familiar with essential shipboard procedures relating to the safety of the ship. The crew was unable to demonstrate proficiency in performing a satisfactory fire drill as evidenced by two consecutive failed fire drills. During the fire drills, the crew did not establish proper fire boundaries as per their SOLAS training manual, did not carry the appropriate key to access the space simulated on fire, and did not properly don personal protective equipment prior to entering the space. Garbage. Crew failed to follow essential shipboard procedures as outlined in the Garbage Management Plan relating to the prevention of pollution by garbage. The vessel is equipped with a comminuter, but the vessel’s comminuter is not used. PSCO noted that 7 entries were made into the garbage record book showing the vessel discharged 0.20 cubic meters of food waste directly overboard into the Wider Caribbean Region. Reports/analysis of non conformities. The vessel’s company provided corrective actions to take for the same garbage pollution prevention deficiencies from a Coast Guard Port State Control exam on June 10, 2013. The master/crew did not implement these corrective actions. The Master stated that he did not conduct training to implement the corrective actions and continued to discharge food waster directly overboard into the Wider Caribbean Region. Fire Fighting. PSCO Observed a 1 inch hole in the fire main at the number 3 cargo hold spraying water. In addition, PSCO also observed some leakage from the fire main near cargo hold number 5. Other(machinery). PSCO observed flexible hoses coming off of the piston lubricator vent directed to the telesco fresh water oil separator tank. Certificates of competency. The Chief Engineer, 2nd Officer, 3rd Officer and 3rd Engineer could not produce an appropriate Flag State certificate (license), a valid dispensation, or provide documentary proof that an application for an endorsement has been submitted to the Administration. Fire prevention. Excessive fuel oil leaks, accumulation of oil in the bilge and oil soaked lagging were observed throughout the engine room creating an unsafe condition and posing a significant fire hazard. Fire prevention. The emergency fire pump was not in proper working order and ready for immediate use. During the PSC exam, the emergency fire pump when energized was leaking water excessively into the space. Crew had to secure the emergency fire pump to avoid flooding the pumps compartment. Lifesaving Launching Appliances. The starboard and port lifeboat remote release wires were not installed as per manufacturers specifications. Means of escape. The purifier “A” class fire boundary door becomes jammed and cannot be opened by one person. Lubricating Oil Service System. Lagging throughout the engine room was oil soaked. Accommodation/Occupational Safety. All generators and the air handler fan have had guards removed. Bilge System Management. Vessel did not have adequate tank capacity on board to keep up with oil waste generation. Pollution prevention equipment. The oily water separator was inoperative. Pollution prevention equipment. The incinerator had excessive oil on the insulation causing a hazard to personnel. Lifeboat. The starboard lifeboat had cracks in the hull near the port quarter rub rail. Safety Management System. Taking into consideration the general condition of the ship found while PSCO’s were onboard, an external audit was recommended. Fire prevention. Excessive oil leaks found throughout engine room and multiple seals leaking near hot surfaces in the purifier room. Oil-soaked lagging and oil-sprayed bulkheads were also present excessively throughout engine room. Fuel oil day tank valve stem was leaking excessive fuel oil into its containment and the fuel oil valve in line before the duplex filter to the main engine was leaking into a plastic jug. The leaks and the presence of fuel/oil throughout the engine room pose a serious risk of fire to the vessel and its crew. Maintenance of ship and equipment. Vessel was not following its Safety Management System in regards to engineering equipment and machinery maintenance as evidenced by excessive oil leaks throughout the engine room. Multiple maintenance tasks were found overdue, some for months, and were not deferred. Vessel’s crew was also not notifying the company of the lack of maintenance on board as required by the SMS. 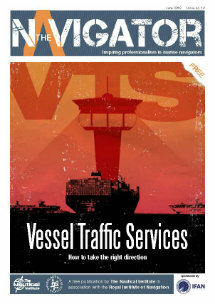 Vessel has been recommended for ISM Audit. Fire prevention. PSCO observed the air supply line to the quick closing fuel shutoff valve on the HFO settling and Service tank for the main engine was disconnected, rendering the valves incapable of being remotely closed from outside the space in the event of a fire. Vessel was at the time on Low Sulfur fuel, however the valve for the HFO Settling tank was open. The second engineer provided documentation and confirmed that the previous test of remote valves was conducted on June 12, 2013 and the air supply line has been disconnected ever since. Inert Gas System. PSCO observed the high velocity pressure valve for the number 1 starboard cargo tank not seated properly, resulting in inert gas free flowing into the atmosphere. Bulkheads, corrosion. The PSCO discovered excessive wastage on aft bulkhead of engine room allowing free communication through between compartments. In addition, the PSCO discovered the wastage on the port side engine room overhead allowing the ingress of water from the deck above. MARPOL related deficiency. During an operational test of the OWS, the crew could not prove proper operation/calibration of the oil content meter. Detection. The PSCO discovered all existing smoke detectors installed in the engine room to be inoperable. Certificates of competency. The Chief Mate could not produce an appropriate Flag State certificate (license), a valid dispensation, or provide documentary proof that an application for an endorsement has been submitted to the Administration. Fixed fire extinguishing installation. The PSCO discovered the fixed fire extinguishing system in the engine room was inoperable and not ready for immediate use. Fire prevention. PSCO found the quick closing fuel shutoff valve on the No. 1 heavy fuel oil service tank for the main engine and ships service generators blocked in the open position with a bolt. Valve was not capable of being remotely close from outside the space in the event of a fire. Pollution prevention equipment. PSCO noted that the date on the oil content meter was off by 4 days. When asked, Chief Engineer could not provide instruction manual for Oil Content Meter. Certificates of competency. The Chief Engineer and Chief Mate could not produce an appropriate Flag State certificate (license), a valid dispensation, or provide documentary proof that an application for an endorsement had been submitted to the Administration. Ballast Water Managment. Vessel discharged ballast without making a notification to the Coast Guard or the National Ballast Information Clearinghouse. Cargo Stowage. PSCO found drums of oil, paint, propane on the port side rail amongst food items, refrigeration items, and other miscellaneous cargo. Cargo Stowage. Oxygen and acetylene bottles were stowed secured to port side rail. Collision/Grounding Avoidance. No portable battery for signalling lamp was found onboard. Piloting/Steering. No spare magnetic compass. Collision/Grounding Avoidance. Bridge visibility not according to international regulations. Lifebuoys. Lifebuoys (one on each side of the vessel) did not have self-igniting lights in working order. Inflatable Liferafts. Starboard side liferaft was expired. Emergency Steering. Emergency steering not tested onboard on a regular basis. Inflatable Liferafts. Hydrostatic release unit on port side liferaft expired. Fire Extinguishing System. Ship’s master and crew could not provide PSCO with maintenance records for the ship’s water mist fire-fighting system in accordance with manufacturer’s manual. Provide corrective action plan from company with concurrence form administration with regards to conduct and records of local water mist maintenance. Piloting/Steering. 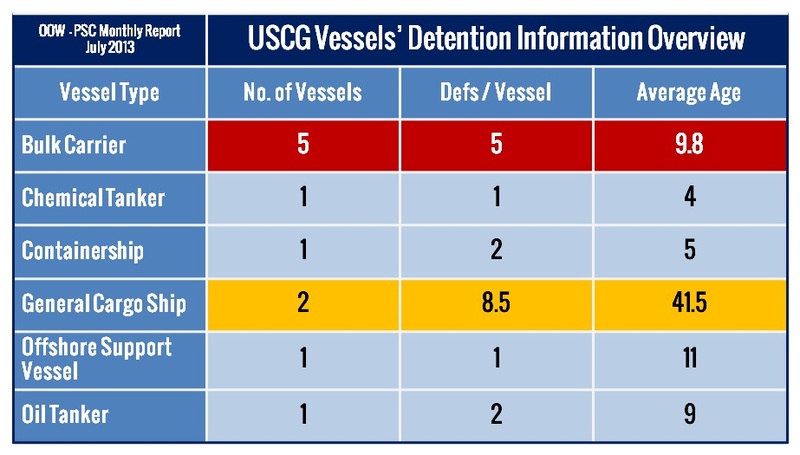 PSCO noted during bridge exam that vessel proceeded 115 miles up Mississippi River without proper charts. Vessel relied on ECDIS which was not listed on SOLAS Safety Equipment Cert Form E, and received charts upon arrival at anchorage. Piloting/Steering. 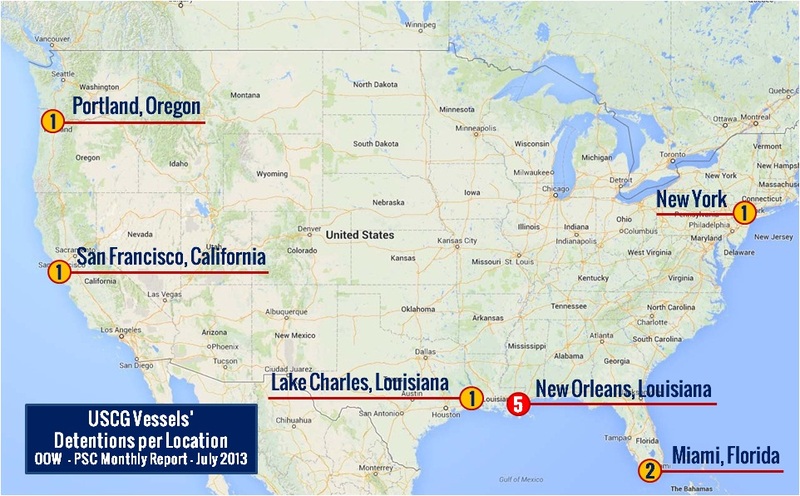 PSCO noted vessel’s voyage plan listed charts for the Mississippi River when the vessel did not have them on board or available for passage. Provide corrective action plan form company with concurrence form the administration with regards to proper planning of a ship’s voyage. Safe means of access Deck – hold/tank, etc. Information Update 30 August 2013. 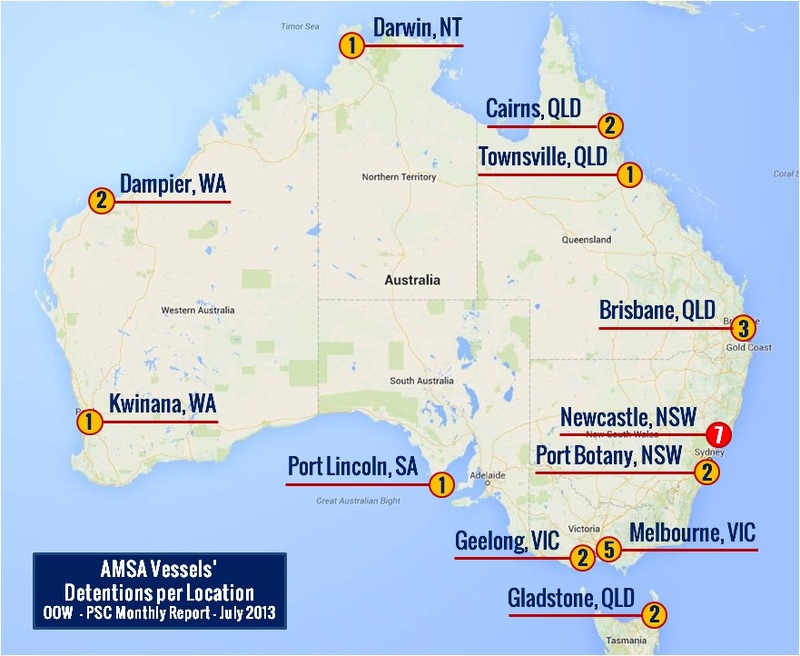 The Maritime and Coastguard Agency (MCA) announced that three foreign flagged ships were under detention in UK ports for July 2013. 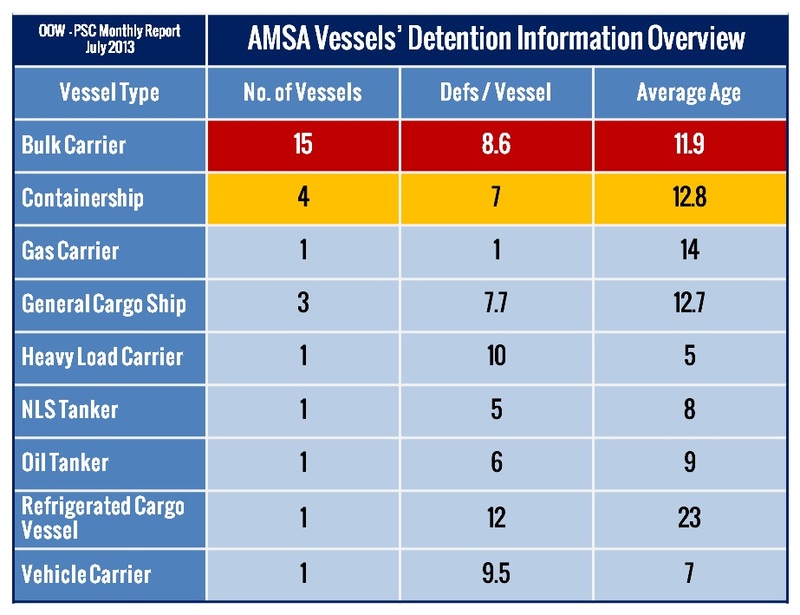 Although there were no new detentions during July 2013, three vessels remained under detention from previous months. Moreover, there has been a decrease of 3% in detentions since June 2012. 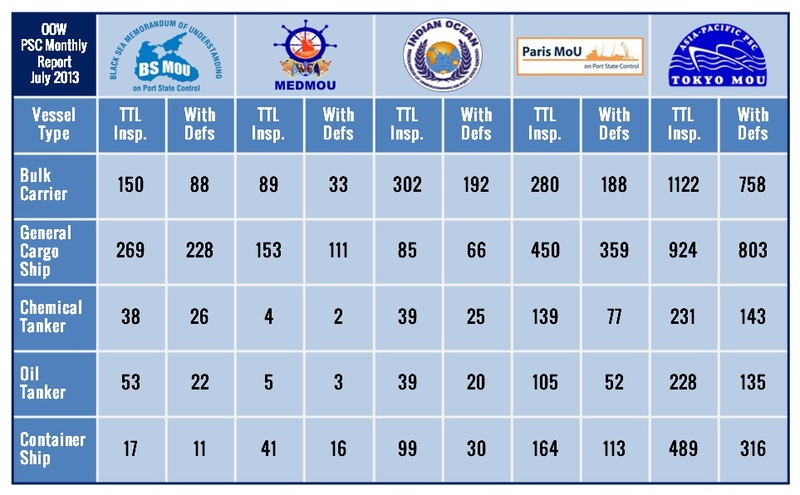 Two of the detained vessels were registered with a flag state listed on the Paris MOU white list. Serious failure or lack of effectiveness of implementation of the ISM code on board the vessel. Fuel oil leaks and a major non conformity was identified with respect to the lack of maintenance of the ship and equipment. Main fire pump was inoperative and there was no alternative fire pump outside the machinery space. For July 2013 according to the database of Transport Canada there were no detentions in ports under the authority of the Canadian Coastguard. The Paris MoU database (Canada is member of the Paris MoU) shows also that there were no records of detention for the period under review. 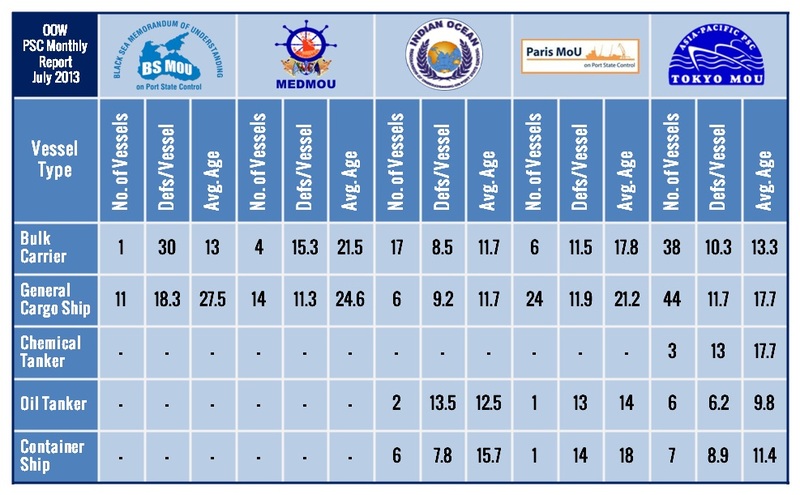 The following information have been gathered mainly from PSC MoUs websites as well as from various Coast Guard Authorities and may serve only as reference for the inspections being carried out each month onboard merchant vessels. The consistency of the information may differ between MoU since there are slight differences on the way each organization presents the inspection info as well as due to the fact that some countries are member in more than one PSC MoU. For more information on the inspections carried out please refer to each organization’s website.